Several summers ago in the midst of a crisis of faith and doubt about my call to the church, I fled to the Northwest for a period of reflection and discernment. One Saturday morning I was invited to join a small group for a hike assured that, “If you’ve ever walked in the mountains, you can do this hike.” I grew up camping in the mountains of North Georgia and North Carolina – I was confident that I could handle a Saturday walk in the evergreen forests of British Columbia. After all, an evergreen forest is an evergreen forest, right? It’s at this point that I began to notice God using metaphor to reshape and redefine my understanding of what it means to be connected to the life of the church, to be called by God to service in the church. That Saturday morning it was overcast. On the way north out of Vancouver clouds were sitting low on the mountains and coastal inlets – almost as though heaven had settled down upon the earth. When we arrived at the starting point for our hike, the parking lot was full of buses disgorging tourists who were older and in far worse physical shape than I. My confidence grew – and my interest plummeted. If this was going to be a stroll through orderly groomed paths with a thousand other tourists I’d rather not, thank you! But our guide led us beyond the tourists gathered at the foot of a cascading fall of water and onto a quiet open forest floor beneath towering trees. The layers of needles cushioned our footsteps and as we walked, we talked in quiet whispers – as though to speak loudly would be a violation of sacred space. Within an hour, I was struggling for breath. The gently rising slopes were now steep enough that someone had helpfully used the trunks of trees to form steps into the hillside. Though I hadn’t counted, it felt like we must’ve climbed at least a thousand of them. Up ahead the steps were formed out of the boulders of the mountain. And so it went for the next two hours, with each step getting steeper, and my asthmatic lungs working harder and harder to take in less and less oxygen. The boulders were so high that each step drove my knee into my chin. My hips, thighs and knees were screaming from the constant repetition and stress. To add insult to injury it began to rain, the ground got slicker and I wondered if we’d ever reach the summit – if we’d even be able see anything once we got there. Each obstacle seemed greater than the next. First the tree-formed steps, then the boulders, now a steep crevice of rock with a stream of water flowing down the middle of it. Again, someone had had the foresight to bolt a chain into the rock to give a handhold while we struggled to find purchase for our feet against the wall of rock. I had come too far to give up now. As I scrambled over the ledge onto a small flat shelf of rock I could see the final obstacle that stood between me and the summit – a long, sloping, rain slick rock that dropped precipitously on both sides. Nearby a young woman from another group was clinging in terror to her guide, fearful of going forward and equally afraid of going back down. Some of our group had gone on ahead of the rest of us, impatient at being slowed by my progress. But one of my traveling companions, a young Chinese student, had long since relieved me of my pack, given me aid up the wall of rock and stood ready to give me a hand if I needed it. Each step I took left me uncertain about my stability on the rain slick rock and several times I found myself sliding on my belly back down the face of the rock. Two other young theology students who had grown up in the mountainous regions of China began to pick their way step by step along the rock face. As they did they would gently place my feet in the spots they had tested and found secure. Slowly, step by step, feeling more secure with their experience to guide me, we climbed to the top of Squamish Chief. Without them, I never would have made it. As we reached the top, the sun broke through the clouds and the valley floor was laid out before us – as though God was rewarding us for our effort. Too many of us Christians in the west have been led to think of the “Jesus Way” as something more like a climate controlled ride on a comfortable tourist bus. Moderately challenging, somewhat interesting, but nothing that will work up a sweat or push us too hard – and if things get too rough, we can always scamper back on the bus where temperature controls are at our fingertips and we can watch the climbers through our binoculars. 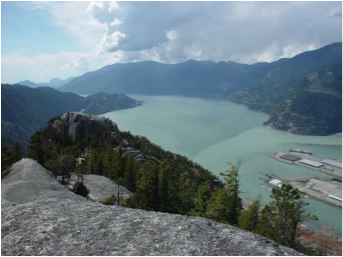 The further I travel along the Jesus Way, the more convinced I am that it is more like that Saturday climb up Squamish Chief. The journey grows more challenging with each step, with each turn in the path. If you pay attention, you’ll notice the companions along the way – yes, some are so eager to get to the top they will gladly leave you behind. But there are also those with infinite patience, those who will point out to you the finger holds, the ledges you cannot yet see, the footholds that have proven secure for them. 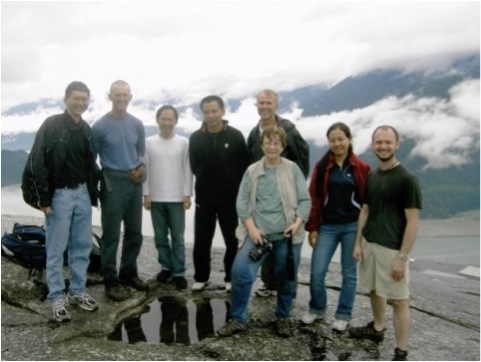 When we left the summit of Squamish Chief that day, those young Chinese students literally held my hand all the way to the safety of the groomed trails at the base of the mountain. I now serve a community whose vision is “to encourage one another daily to follow in the way of Jesus.” When I think of what it means to “encourage one another daily” I think of those Chinese students who were my encouragement on the journey up (and down) Squamish Chief, who measured the pace of their own journey to make sure that I, too was able to follow along the way, to encourage me not to give up when the journey seemed to be impossible.